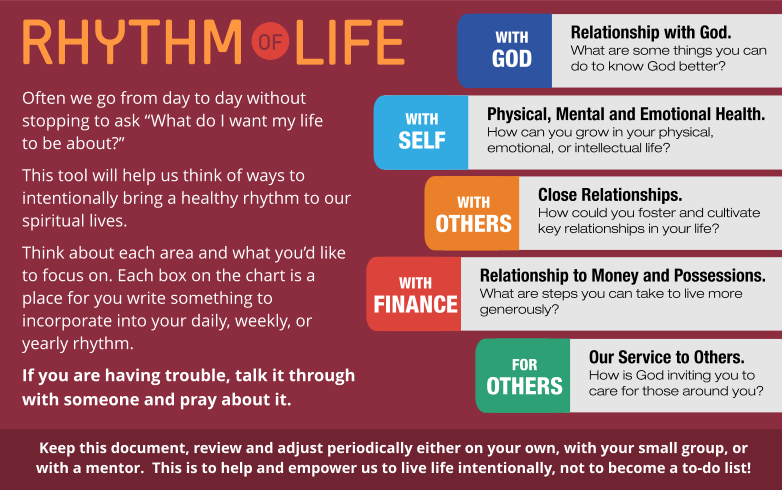 Often we go from day to day without stopping to ask “What do I want my life to be about?” This tool will help us think of ways to intentionally bring a healthy rhythm to our spiritual lives. If you are having trouble, talk it through with someone and pray about it. Our spiritual lives in relationship with God. What words or phrases best describe the state of your heart and soul today? How would you like to describe your spiritual life? In relation to the Word of God? How are you reading and reflecting on the biblical text? What would be one next step that would help you go deeper? What is your current spiritual practice in relation to your life of prayer? Is there practice of you’d like to prioritize? Do you want to draw closer to God this year? what are some ways to know God better? What rhythm of diet, exercise, and rest would you like to pursue? Be specific. What are your desired hobby and recreational priorities? Be specific. What are your desired emotional and intellectual priorities? Be specific. Who are the people that mean the most to you? How could you deepen those relationships so they continue to be a source of ongoing encouragement and enrichment? Do you feel called to come alongside some of your key relationships in order that healing, hope, forgiveness or restoration can occur? What commitments can you make to help you foster and cultivate these key relationships? As you reflect prayerfully on your material and financial life, what do you sense the Lord is inviting you to adopt as new or renewed practices? What is one step toward generosity you can take this year? What are steps you can take to live more generously? 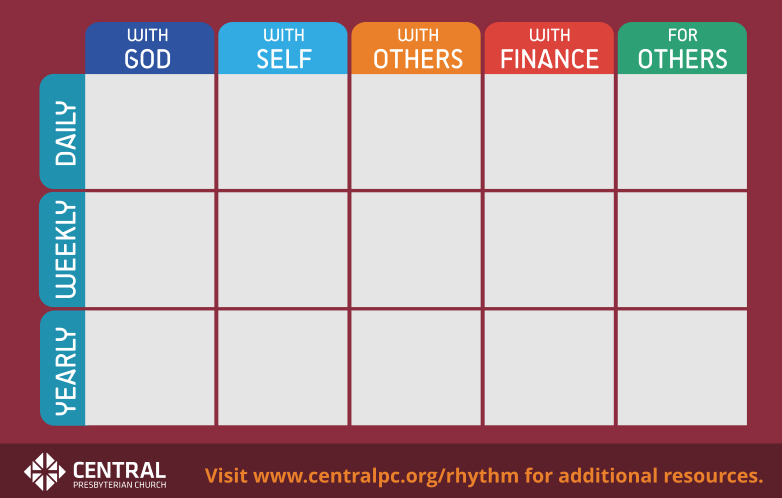 In what ways do you desire more simplicity in your material and financial stewardship priorities? 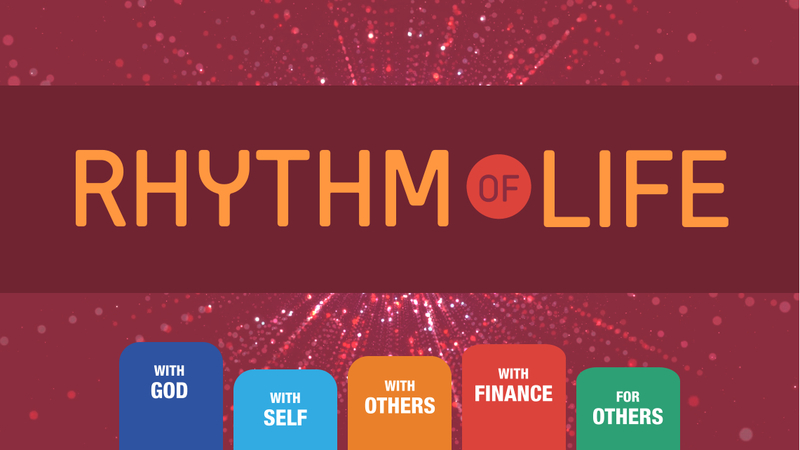 What can you reduce, eliminate or organize in order to be freer in your financial life? Life in service to others. Where and with whom are you currently investing yourself in service to others? This can include in the marketplace, community, church, and family, domestically or abroad. Where and with whom do you desire in the future to invest yourself in service to others? Again, this includes the marketplace, community, church, and family, domestically or abroad. As you prayerfully review your current and desired places of missional service, which areas are most life-giving? Should any be eliminated because they have come to an end or the situation has changed and they are inappropriate investments of your gifts and calling?